Fender has been the instrument choice for many of the greatest musicians since 1946. Fender's popularity through the generations is a result of our design innovations and commitment to quality. These strings reflect this legacy and are worthy of the Fender name. 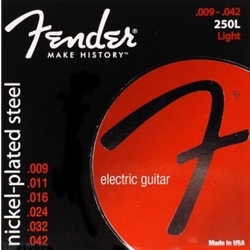 Fender® Super 250's Nickel-Plated Steel (NPS) strings combine the high output and dynamic sound of steel with the smooth feel of nickel; perfect for rock and other styles of music where the guitar needs to cut through. Strings are high output and dynamic.